UMP | University of Minnesota Press Blog: Boston Mania: What drives us, professionals and amateurs alike, to run a marathon? Boston Mania: What drives us, professionals and amateurs alike, to run a marathon? 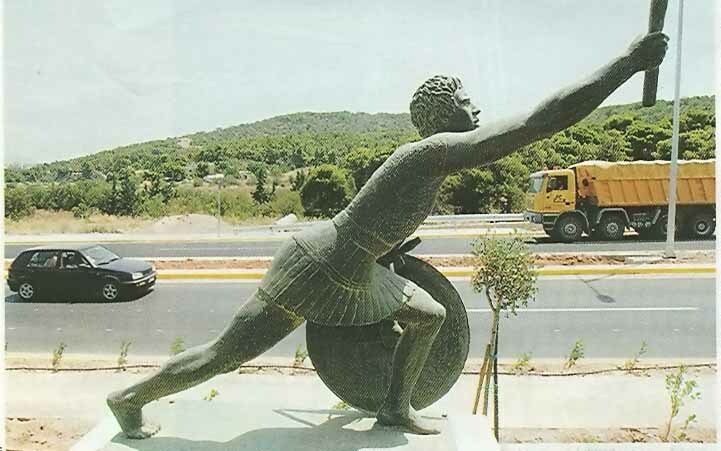 A statue of Greek soldier Pheidippides on Marathon Road northeast of Athens. According to legend, Pheidippides died after a 26.2-mile run from the Battle of Marathon to Athens to announce the Greek victory over Persian invaders. Image from Creative Commons. Monday marks the largest sporting event in New England. Though less telegenic than Red Sox baseball or Patriots football, the Boston Marathon routinely draws crowds of half a million to watch more than 25,000 runners plow through the streets of Boston. One of the most prestigious marathons in the world, Boston crowds are no doubt drawn to see whether last year’s course record will be broken or if, finally, the two-hour marathon mark will be broken. However, the largest draws are not the remarkable professional distance runners seeking to break the ribbon at the end of the race. The biggest draw is the pack of tens of thousands of amateurs who have trained and raced to qualify for the event. As a collective public spectacle, marathons place the limits of human body on display not only by the freakishly fast professional runners but by the ordinary people who haul their bodies up and down hills in front of throngs of supporters. The amateur marathoner who runs not for first place or for the cash prize but for personal gratification represents a cultural glorification of self-discipline that often fixates on the body. As a sporting event, the marathon has changed remarkably in the last four decades from its origins as an exclusive event primarily dominated by male professional runners and former athletes. Indeed, 2012 will mark the 40th anniversary of the first Boston Marathon, in which women were officially allowed to enter. The race was considered so impossible and even dangerous for women that in 1967, when Kathrine Switzer entered as “K. Switzer,” one of the race organizers had to be tackled to be prevented from removing her number (and perhaps her physical body from the course) during the race. The refusal to allow women to race was a combination of a belief that women’s bodies were simply too weak to safely navigate 26.2 miles and a reflection of the mystique of the race itself. The distance of the marathon is, of course, the stuff of legends, drawn from the supposed distance run by the Greek soldier Pheidippides from the Battle of Marathon to Athens. The fact that the soldier, after issuing his news about victory in battle, promptly died has made the event a classic celebration of pushing the limitations of the human body in superhuman feats of athletic prowess. As women entered races in increasing numbers in the 1970s, the marathon began its long journey from an elite and exclusive club to a community event with broad participation. Even as road races of considerably more manageable lengths have also proliferated, the marathon retains its allure as an exceptional achievement. Subsequently, the length of races has increased dramatically as race officials keep courses open longer to accommodate finishing times that range from just over two hours to over seven. As a consequence of the growing popularity of marathons as a participatory rather than merely spectator sport, the market for runners’ gear has also multiplied. Running is not merely a matter of slapping on a pair of sneakers and heading out for a morning jog. In addition to the ubiquitous running gear that promises moisture wicking, cures for over-pronation, and more attractive race photos, the marathoner-in-training has an array of products from which to choose. Store shelves are now stocked with fluids for pre- and post-run hydration, gels to aid with electrolyte imbalances, and various protein concoctions for muscle recovery. The runner with means can avail herself of various tests to evaluate her gait efficiency, gauge her VO2 max, and get nutritional analyses. The most recent innovations have been in the use of technology to provide runners with virtual trainers and training partners, human and non. The newest innovation has been the integration of technology like pedometers, GPS, and heart rate monitors with smart phone apps. Apps like “Map My Run” enable the runner to not only monitor their day-by-day training but to share that information with a social networking community, often billed as a way to “hold yourself accountable” to a larger community. More creative versions like the popular “Zombies, Run!” integrates daily runs into a virtual game in which the player's workouts lead to rewards in an ongoing survival game. The explosion of popularity in a sport that is best known for killing its first participant and in which the average runner gets little tangible reward other than a T-shirt and race medal, raises the question of why marathoning has such a large popular following. Some of the allure of the race might come from the ability to claim the title of “marathoner,” not only in the sense of accomplishment but from the impressed nods of those who acknowledge the achievement. Those nods, however, capture meaning of marathoning in popular lore. To have completed a marathon tells us something about the person, a sense of commitment, self-discipline and management of the body. Even as the ill-fated Greek soldier’s run is a symbol of his great passion and commitment to his polis, the amateur runner’s race T-shirt is a symbol of their commitment to self-governance, to willing themselves to overcome the limitations of the body and to achieve a specific goal. The sense of accomplishment is not merely external, however, but also represents the joy derived from practices of self-discipline. Long-distance running is less about crossing the finish line but about the process of getting there, the careful monitoring of nutritional intake, planning out a schedule months in advance, calculating distance and rest times, and squeezing in training runs in the lunch hour. Unlike Pheidippides, driven by a love of country, the modern amateur marathon is driven by a love of the self, a self that derives pleasure from the exercise of self-control. Claire E. Rasmussen is associate professor of political science and international relations at the University of Delaware. She is author of The Autonomous Animal: Self-Governance and the Modern Subject. "This captivating book is about the paradox of freedom that we moderns experience as the compulsion to autonomy. Whether we are becoming adolescents, addicts, vegans, or athletes we subject ourselves to become independent so that we can experience freedom. This drive to experience freedom divides those who become autonomous (mature and respectable) and those who must be governed. The book is an impressive intervention on the paradox of freedom that is at once a space of possibility and oppression. Claire E. Rasmussen shows a behind-the-scenes glimpse of intriguing and inspiring subjectivities through that space." Glad to read a special input of a professor! As we know behind every great achievement there is a supreme sacrifice is must what is proved once again here by Pheidippides. Thanks for a excellent share.